Editor Note: above is Laura Miller of KioWare, Randy Amundson of Frank Mayer and Associates Inc., and David Capozzi, executive director of U.S. Access Board during meeting in Washington, DC. click for full size. Thanks to Olea for image & text. Regulatory agencies have a profound effect on the business of self-service. The kiosk industry group monitors kiosk and self-service ADA, Accessibility and the development & implementation of regulatory bodies and, where possible, we participate in the regulatory process by educating and informing agencies regarding our members & businesses. 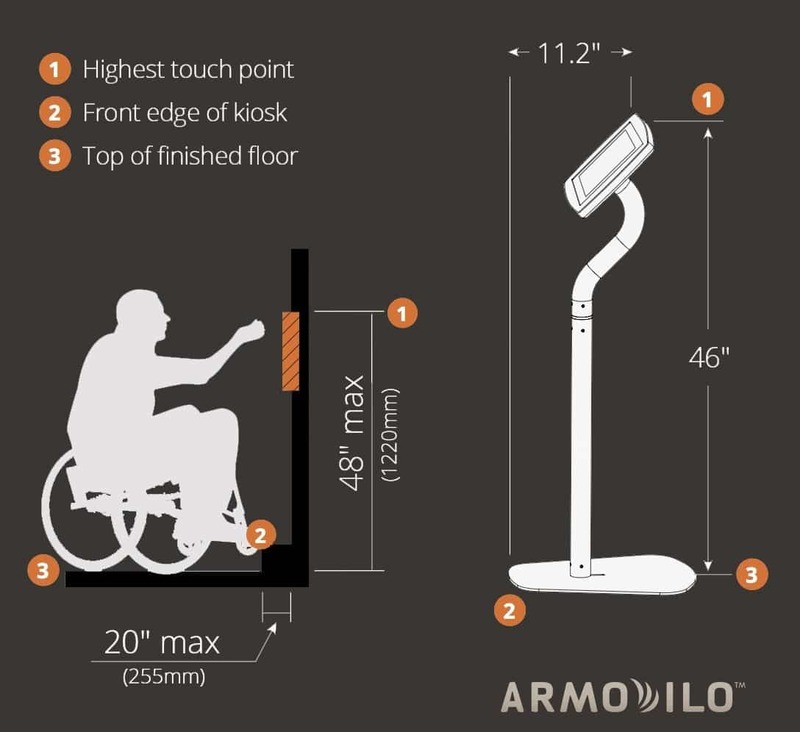 Wheeled Mobility Project — The entire report can be downloaded from that page. Please pay particular attention to Section 3.3.15 Reach. Also, the following sections are related to reach and, to some extent, explain the data: 3.3.6 Knee Clearance Height, minimum; 3.3.7 Toe Clearance Height, minimum; 3.3.8 Knee Clearance Depth, minimum; and 3.3.9 Toe Clearance Depth, minimum. Section 3.3.14 Grip Strength may also be of interest. Tech for All – significant experience in designing audio interface utilizing navigation aid particularly NavPad by Storm for accessible kiosk. A New Spin on Song-Beverly Act Litigation Against Retailers – how personal PII enters the equation. Also cameras and the proximity of the POS device. The Department of Justice has launched a new Accessible Technology section for ADA.gov, its Americans with Disabilities Act (ADA) Web site, to further assist covered entities and people with disabilities to understand how the ADA applies to certain technologies, such as Web sites, electronic book readers, online courses, and point-of-sale devices. Covered entities have longstanding obligations to make their programs, goods, services, and activities accessible—including those they provide online or via other technology. The new Web pages compile in one place the Department’s technical assistance and guidance about accessible technology, as well as information about the Department’s accessible technology enforcement efforts, regulation development, and other federal accessible technology resources and initiatives. Article by EBN — Effective July 18, 2016, a new “meaningful access” rule interpreting the Affordable Care Act’s Section 1557 Anti-Discrimination requirements requires providers of health care programs and services that receive federal financial assistance to comply with new requirements for effective communication, including accessible electronic information technology.